Stromboli (Eolian Islands, Italy): Activity at the volcano has increased over the past month and although still at levels considered within normal limited, can be described as elevated. It certainly is spectacular to view. 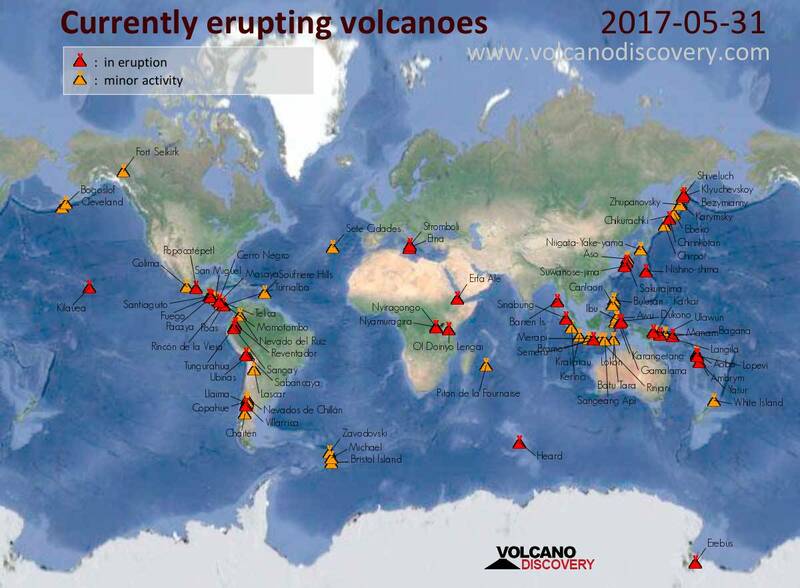 Strombolian-type eruptions occur every few minutes and are strongest from the northeastern vent (N1 on the crater map) and the westernmost vent (S1), ejecting incandescent bombs and lapilli to more than 200 m height. At the moment, there are 4 principal active vents in the crater terrace, clustered into the area of the formerly called NE vents (N1 and N2) and the western (S1) and central craters (C). Near-constant mild spattering as well as occasional explosions have been occurring from the N2 vent, where the magma column seems to be standing particularly high and sometimes shows exploding magma bubbles. Volcanic Ash Advisory Center Darwin (VAAC) issued the following report: ERUPTION REPORTED TO FL110 MOV S AT 31/0023Z. Dukono (Halmahera): (30 May) Volcanic Ash Advisory Center Darwin (VAAC) issued the following report: VA OBS TO FL080 MOV W AT 30/2210Z. Bogoslof (United States, Aleutian Islands): The Alaska Volcano Observatory published two spectacular satellite images (attached) showing the eruption column of the volcano's large explosion on 28 May (22:34 UTC). Image data provided under the Digital Globe NextView License. Image credit Dave Schneider, USGS Volcanoes/AVO. Volcanic Ash Advisory Center Anchorage (VAAC) issued the following report: NO ERUPTION. Colima (Western Mexico): The volcano has remained calm since the series of powerful explosions in Jan-Feb this year. A recent report by scientists from the Universidad de Colima mentioned ongoing seismic activity as well as very week explosions. Fuego (Guatemala): The activity at the volcano has again been increasing during the past days. The volcano observatory reported frequent moderate strombolian-type explosions ejecting glowing lava fragments to 250 m above the crater. Moderate to strong shock waves accompany the explosions. Corresponding ash plumes have been rising to 1000 m height and drifting up to 12 km in westerly directions before dissipating. Light ash falls were noticed in the Panimache, Morelia and Santa Sofía villages. If the volcano follows its rhythmic pattern, Fuego is probably heading towards a new paroxysmal phase in the near future. Erta Ale (Danakil depression, Ethiopia): The activity of the volcano remains intense and continues from both the summit (lava lake in south pit) and from the SE rift zone (lava lakes and lava flows). The summit lava lake has gradually risen again, but undergoes frequent changes as the field report below describes. On the SE rift zone, the effusive eruption also continues strongly into its 5th month. The lava lake, which had formed above the main fissure vent since January, has been producing multiple smaller and larger lava flows around it, with the main flow feeding a growing, avast pahoehoe lava flow field expanding to the NE. This first rift zone lake crusted over during early-mid May, but a new lava lake formed soon after at a location about 350 m to the east. At around the same time, a new breakout of lava started in early May and has been feeding a new flow field overlapping the previous one into NE direction, currently more than 1500 m long and over 500 m wide.